Kristabella Creations 8x11 Baby Scrapbook Album, Baby Memory Book, Baby Shower Gift, 20 interactive inner pages by Kristabella Creations at Nicky's Blog. Hurry! Limited time offer. Offer valid only while supplies last. This gorgeous baby scrapbook album makes the perfect gift for every new mom and a great way to keep all precious memories from baby`s first year! 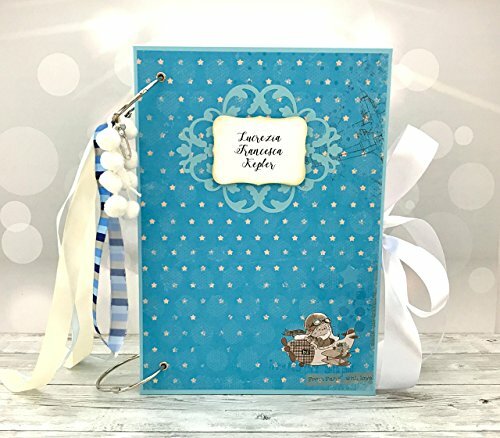 This gorgeous baby scrapbook album makes the perfect gift for every new mom and a great way to keep all precious memories from baby`s first year! Display your treasured photo prints in this beautiful scrapbook that's been made to last. This album is a custom order - yours will be created and personalized for you with a similar design, colors and decorations of your choice. - ALBUM DESCRIPTION: - This unique, one of a kind Baby Boy Scrapbook Album measures approx. 8" x 8" - Interactive - with pockets, flaps, envelopes and individual segments - 20 inner pages (10 sheets) for pictures and notes - pull out cards - 2 usable hard cardboard covers with pockets or envelopes on the inside - Photo tags, memory tags - Decorated with high quality designer papers, embellishments, pearls, etc.